From law offices in Woodstown, New Jersey, The McDonough Law Office offers the rare opportunity for people injured through medical malpractice to have their cases evaluated and managed by an attorney who is also a medical doctor. Even very good physicians make mistakes, and when they do, medical negligence claims can offer hope — and compensation — to the injured and their families. The law firm also represents people injured in car accidents and other personal injury scenarios. 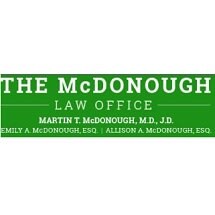 Martin T. McDonough, J.D., M.D., and his daughters, lawyers Emily A. McDonough and Allison A. McDonough, provide in-depth, personalized representation for those who have suffered harm because of emergency room errors, surgical errors and medication errors. Mr. McDonough's medical education and knowledge allow him to provide prompt opinions on potential birth injury cases and other cases involving medical mistakes. Other law firms often turn to this firm for help with critical medical malpractice cases with tight deadlines. Quick turnaround time for screening potential cases is one of the standout characteristics of this New Jersey law firm. Family values, compassion and personalized service are also reflected in the law practice. Potential clients and existing clients alike receive attentive, customized legal counsel. The McDonough Law Office welcomes inquiries from injured patients, family members and other medical malpractice attorneys.